A rustic wedding theme wouldn't be complete without the right stationery to introduce it. 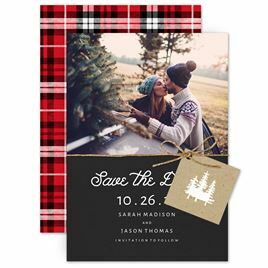 Rustic save the dates are a great way to give guests an idea of your wedding style, and we have a huge collection of rustic designs for you to choose from. 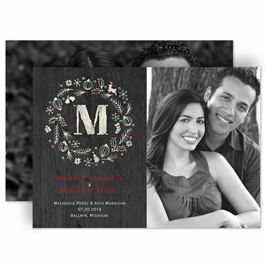 Wildflowers, woodgrains, antique lace, mountain scenery and so much more are available right here at Invitations by Dawn. Whatever your style of rustic may be, we’ve got save the dates to coordinate. Also, we highly recommend taking a look at rustic wedding invitations when it comes time to start inviting friends and family. Don’t forget, we offer a variety of wedding accessories to match your rustic style as well. Whether you’re looking for unity sand ceremony kits or wedding napkins to brighten up your reception tables, you’ll find everything you need for hosting a stylish celebration right here.